NEW YORK – The NHL Awards™ will return to Las Vegas this summer at the world-famous MGM Grand Hotel & Casino, the National Hockey League announced today. The NHL Awards will be held on Wednesday, June 24, at the renowned MGM Grand Garden Arena. "The grandeur and excitement of the NHL Awards makes Las Vegas – and MGM Grand's famed Garden Arena – the perfect backdrop to celebrate and reward the League's best players," said Keith Wachtel, NHL Executive Vice President, Global Partnerships. "We're thrilled to be entering our seventh year with partner Las Vegas Convention and Visitors Authority, who each year have helped us commemorate an unforgettable season in style. This year, the MGM Grand will set the bar high, delivering an amazing show from its renowned venue allowing more NHL fans to attend the event up close and personal." "Las Vegas and NHL are two of the most recognizable brands in the world," said Cathy Tull, Senior Vice President of Marketing for the Las Vegas Convention and Visitors Authority. "This partnership will provide visitors and fans unrivaled excitement during this year's awards ceremony, proving that no destination matches the passion and energy of the NHL like Las Vegas." 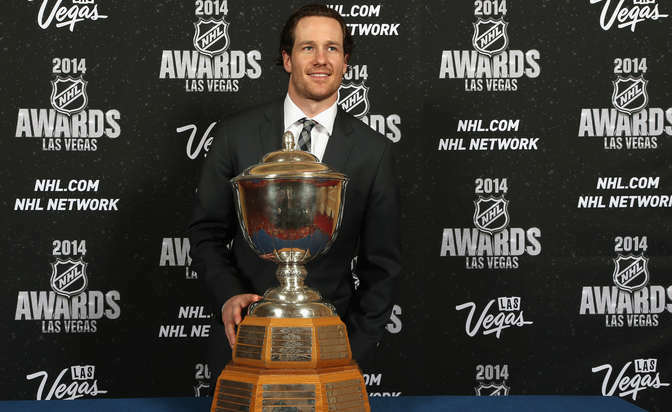 The 2015 NHL Awards will honor the best regular-season players in a wide range of categories, including most valuable player (Hart Trophy), outstanding goaltender (Vezina Trophy), outstanding defenseman (Norris Trophy) and outstanding rookie (Calder Trophy); the Ted Lindsay Award, which is presented annually to the "most outstanding player" in the NHL as voted by fellow members of the National Hockey League Players' Association (NHLPA), also will be awarded. The winners of the NHL's regular-season statistic-based awards also will be recognized. This season, Dallas Stars left wing Jamie Benn captured his first career Art Ross Trophy as the League scoring champion, Washington Capitals left wing Alex Ovechkin claimed his fifth career Maurice "Rocket" Richard Trophy as the League's goal-scoring leader, and Corey Crawford of the Chicago Blackhawks and Carey Price of the Montreal Canadiens won their second and first career William M. Jennings Trophy, respectively, as the goaltender(s) who play at least 25 games for the club allowing the fewest goals.